Ok so this my first video every. Yes I realize there are some kinks to be worked out but I thought it turned out pretty good all thing considered. I also came to the conclusion that I need a bigger memory card too. I am very happy with how this turned out! I think that I will be doing more of this as I found it really fun! I choose the colors because I wanted it to look kind of like a pumpkin, and I think I got pretty close. Well hope you have a mellow Thursday and enjoy the fact that the week is almost over. So with the weather getting colder, like 38 in the morning, I have renewed my vows to my blanket. Not only do I love my new fuzzy blanket but I got a new chair and love it as well. 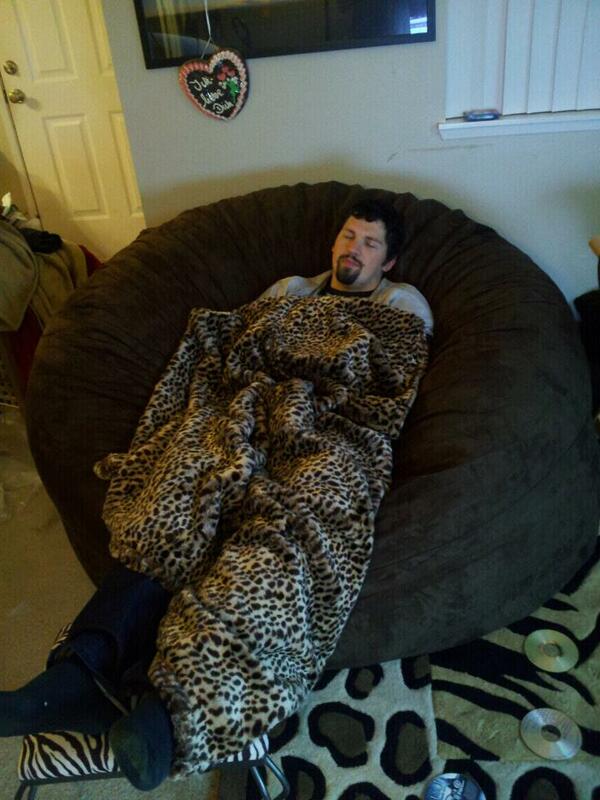 It is the 6ft sack daddy. This is the hubby being so selfless and modeling both the blanket and the chair. Needless to say I love it! But now on to what most of you read for which is the polish. Since I have not done a pink Wednesday in a while I figured I should jump back on that wagon and get to it. I am bringing you today BFF from China Glaze. This is from the OMG collection. It is such a great polish. 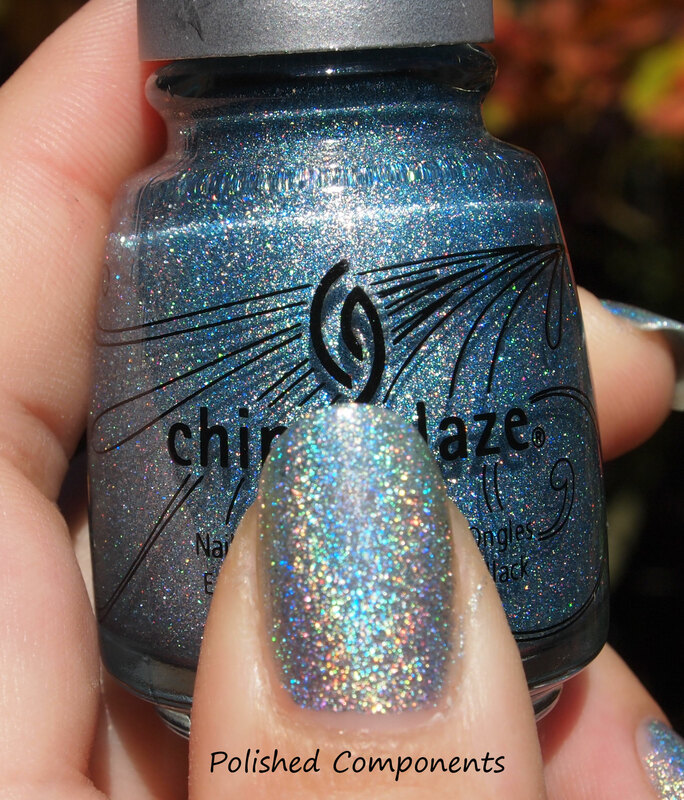 It differs from those in the kaleidoscope collection in that the color the linear holo is in is so much thinker and not as scattered sparkly. 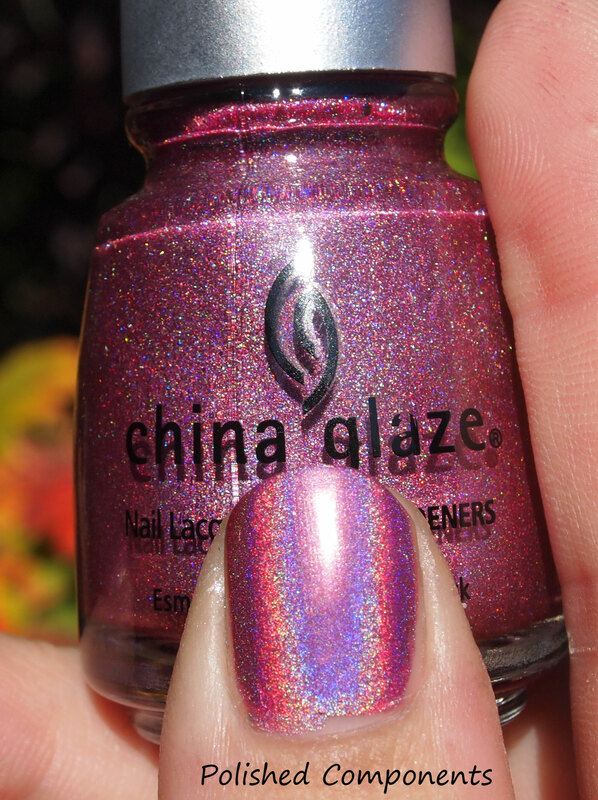 All of the holos that I have tried from China Glaze have been amazing! The dry times are so very fast…. could be considered a quick dry to me. They do not smell and they apply like a dream. This is just 2 coats of the color and you can already see how amazing it is. Well I am not sure what to do for tomorrows mani. 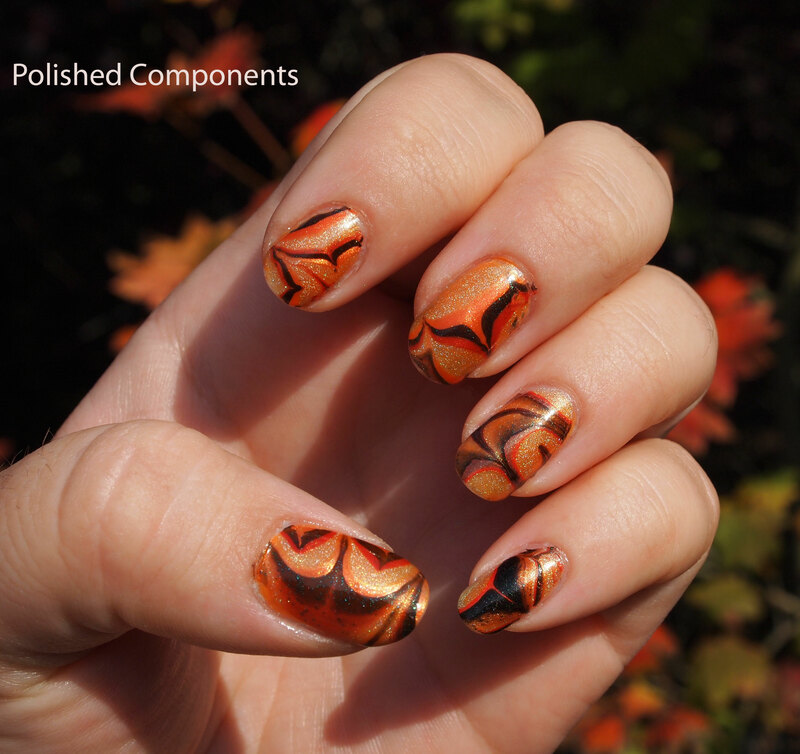 I have a few extra photos stored up but I have been seeing water marbling everywhere and I think I want to do that with a small tutorial… we will see. Kaleidoscope him out its cold. So today reached a blistering 58 degrees… but it was sunny so you know what that means. 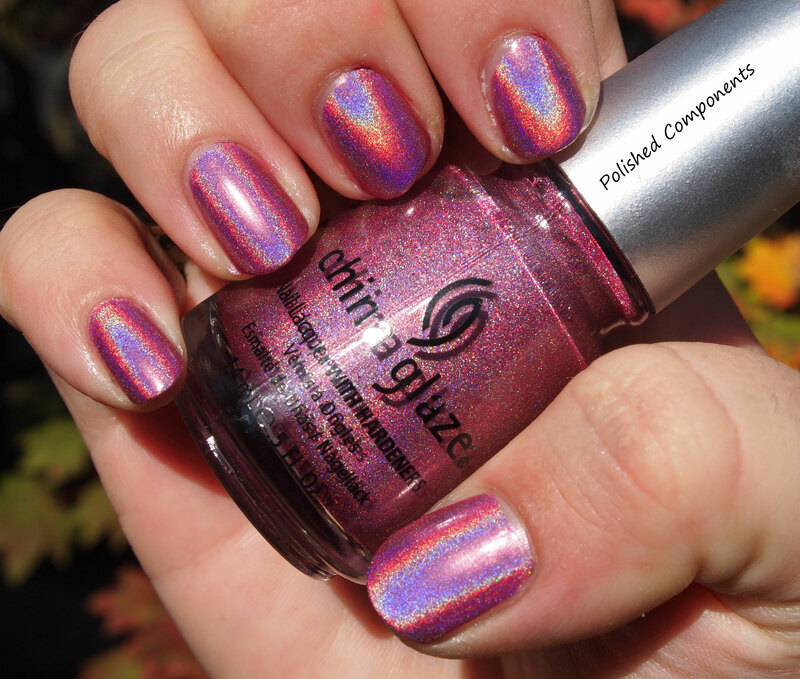 Holographic Polish!!!! So since it was so cold I thought I would put on a light blue and joke that it was so cold my fingers turned blue 🙂 I put on Kaleidoscope him out from China glaze. I wont lie that this is now one of my must have angles when I take pictures of a polish. It lets you really see the name of the polish and get a hint of the color on the nail. This is an older collection that is pretty hard to come by now. It is a light blue linear color with kind of micro shimmer and sparkle to it. These tend to have fantastic dry time and don’t really smell. This was 2 coats and a 3rd was needed but was too lazy… I could get away with 2 as you can see. Well now it is off to kill some zombies with the hubby then snuggle with my hubby. Night all. Which days did I write on? Like me on facebook to follow!